This Day of the Day Cake is perfect to serve up as a celebration of life of your past loved ones. 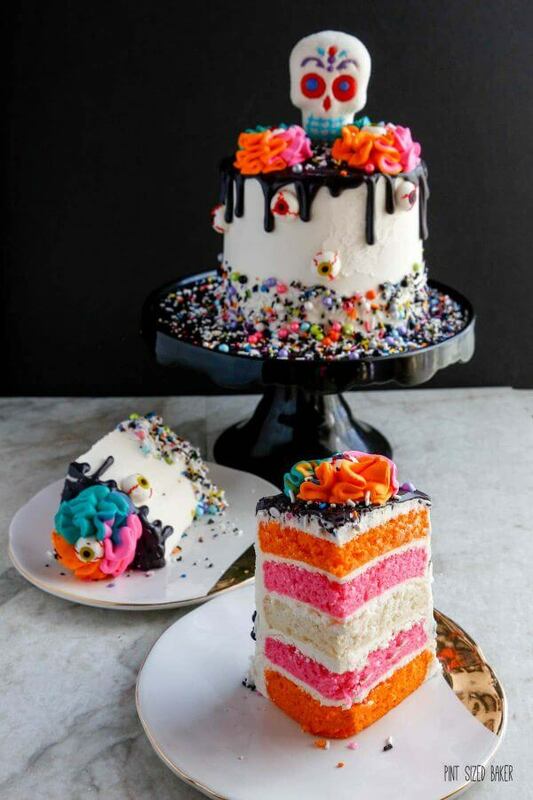 I’d return from the dead for a slice of this colorful cake. Now, I must take a moment to let you know that I knew nothing about the Day of the Dead before I watched “Coco”. What I knew, was totally not real, but what the holiday has evolved into on TV, movies, and social media. I had to do some research and learn a few things for myself before I decided to decorate this cake. This Mexican tradition is all about remembering and celebrating the lives of our ancestors who have passed away. It’s not a sorrowful event, instead it’s a celebration of life. People will pay tribute to their ancestors by decorating their graves, making their favorite meals, and dressing up in bright clothes because death is not viewed as the end of life. Instead, the dead are still with us and it is only during this time that they can travel from the beyond back to the living. I really like this idea that the dead are not gone. So this cake was made to celebrate my grandparents and my dad, all of whom have passed. They would have loved to have one last slice of cake with their families, and I hope that there’s cake wherever they have gone. 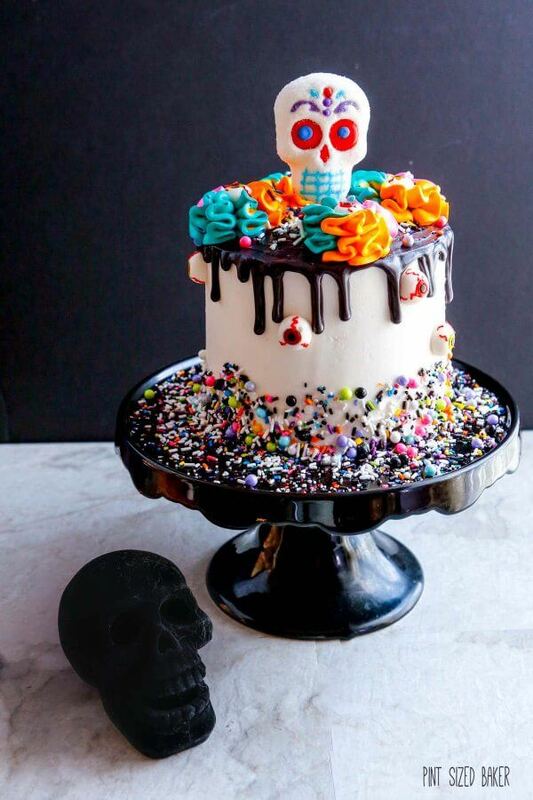 I was inspired to make this cake because of the marshmallow skull I received from Treat Street. I wasn’t sure exactly what I wanted to do, but I knew that it had to be a part of it. 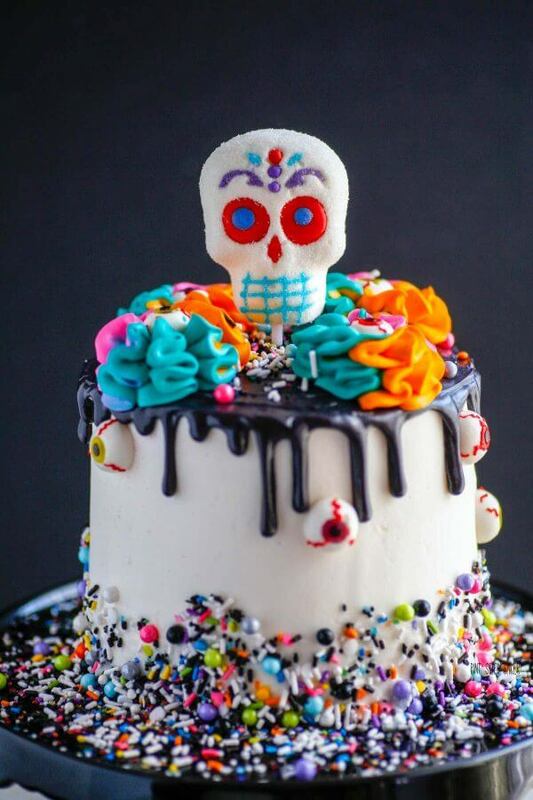 The bight colors in the Sugar Skull Sweets & Treats sprinkle mix had the perfect pops of color with the contrasting black that would be wonderful for a Day of the Dead Cake. You can get as creative as you like with the colors and decorations. Have fun with the cake colors. Paint a skull on the side. Use real marigolds as decorations. Enjoy the time with your family and talk about your memories of your loved ones. 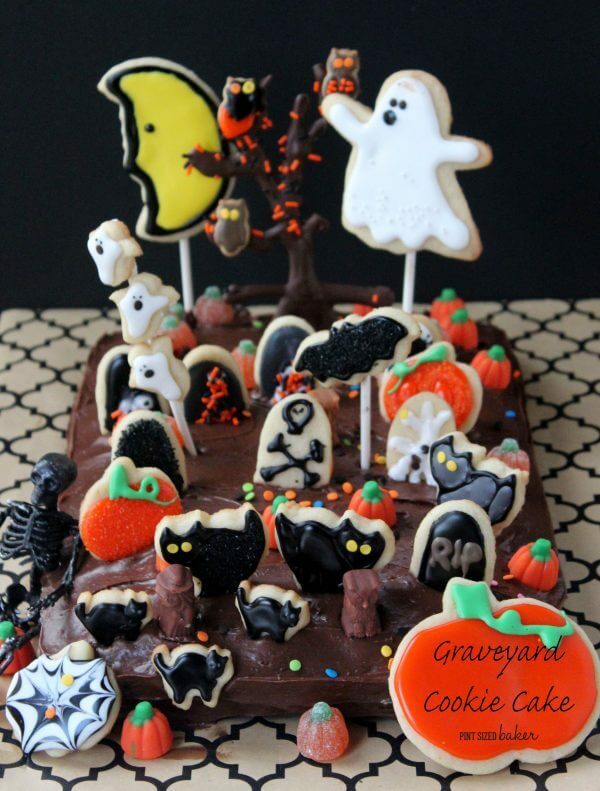 Halloween Sugar Cookies and pumpkin candies decorate this Graveyard Cookie Cake. This Day of the Day Cake is perfect to serve up as a celebration of life of your past loved ones. 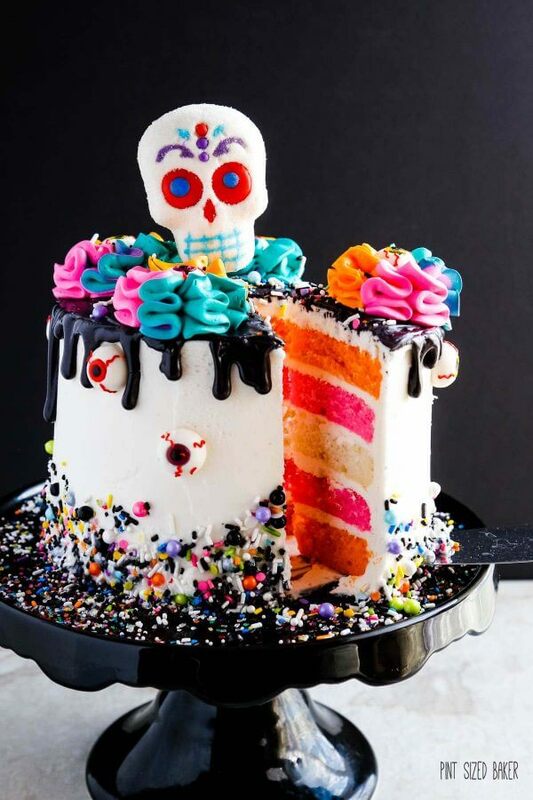 I'd return from the dead for a slice of this colorful cake. For the Cake : Preheat the oven to 325F and prepare 3 - 6" round pans with baking spray and parchment paper. Set aside. Mix together all the ingredients for the cake. Divide the batter into thirds. Color 1/3 pink, 1/3 orange and leave 1/3 white. Bake for 25 - 30 minutes until a toothpick comes out clean. Remove cake from the oven and cool fo r 5 minutes. Turn out on to a cooling rack and let come to room temperature. This is best done the day before. Torte the cake layers and freeze over night for best results. For the Buttercream Frosting : In your stand mixer fitted with ta paddle attachment, beat the butter on medium speed for several minutes until the butter is light and fluffy. Gradually spoon in the powdered sugar, clear extract and tablespoons of cream until all of the sugar in incorporated. Your frosting should be smooth and fluffy. Add more cream as necessary to get the desired thickness. Give the butter a final mix with a large spatula to knock out any air bubbles. Remove a half cup of the frosting and tint it pink. Place another 1/2 cup of frosting in another bowl and tint it orange. Then tint a third bowl of frosting turquoise. Place them into piping bags or cover them with plastic wrap to keep them from drying out. To decorate the cake: Remove the cold cake from the freezer while making the buttercream. Add a layer of frosting to the first cake layer and smooth over. Continue adding cake and frosting until all layers are used. For this cake, I just added 5 layers. Crumb coat the cake with a thin layer of frosting and place it into the fridge for 30 minutes. Coat the final layer of frosting. While the frosting is still soft, add the sprinkles to the lower quarter of the cake. Simply press a handful of sprinkles to the side of the cake. It will be messy, but that's ok. Melt the half the bag of black candy melts and heavy cream in the microwave for 1 minute. Mix until smooth and glossy. Transfer to a plastic baggie and snip off the corner. Create the drizzles and coat the top in the black ganache. Add more sprinkles to the wet topping. Place the three colored buttercream bags into one piping bag fitted with a round Russian Ball Piping Tip with the "S-shape" cut out. 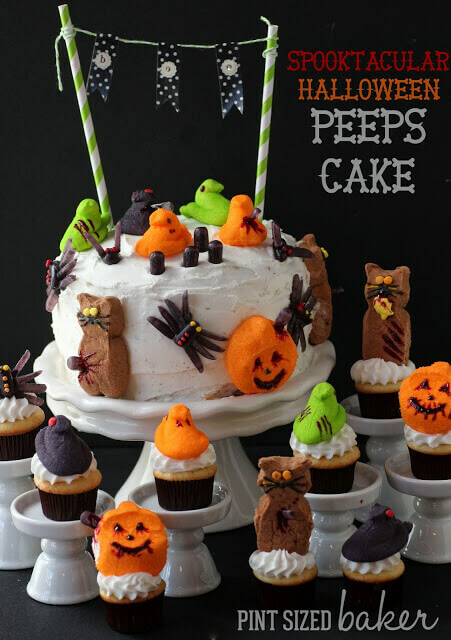 Make three big flower swirls on top of the cake and fill in the center hole with a gummy eyeball candy. 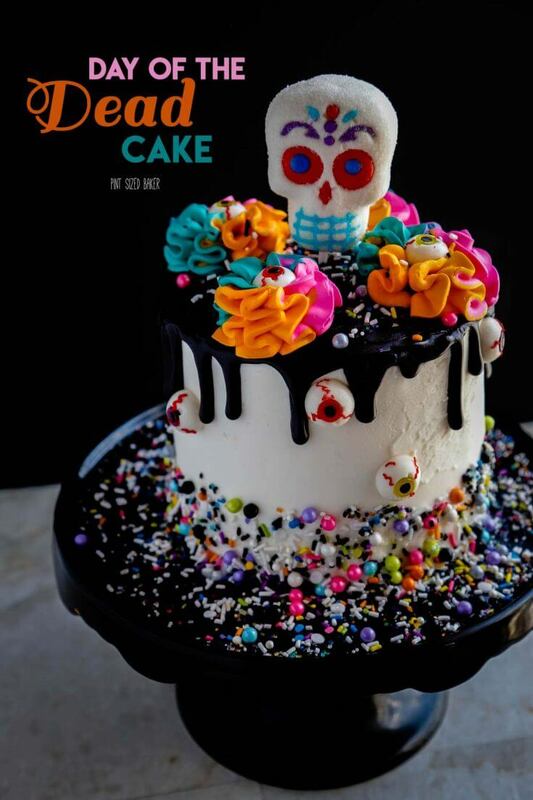 When ready to serve, add more gummy eyeballs with a bit of buttercream and insert the marshmallow skull into the center of the cake. To get really white buttercream, a little trick is to use a hint of purple food coloring to counter the yellow hue that the butter can give the frosting. Just put a little bit on a toothpick and add it to the buttercream. A little goes a long way. Karyn! This cake could not be more beautiful! It is seriously gorgeous. I am 100% jealous of your decorating skills. I have to admit that sometimes I impress myself. I was doubting how this was going to turn out and I was thrilled that it came together so nicely. I’m totally floored by this beauty! So much color and fun in this cake. I love Day of the Dead. It’s so much more colorful than Halloween with it’s orange and black. Thanks so much. It was a lot of fun to create! What an amazing cake. I could never pull this off! I love this SO MUCH! 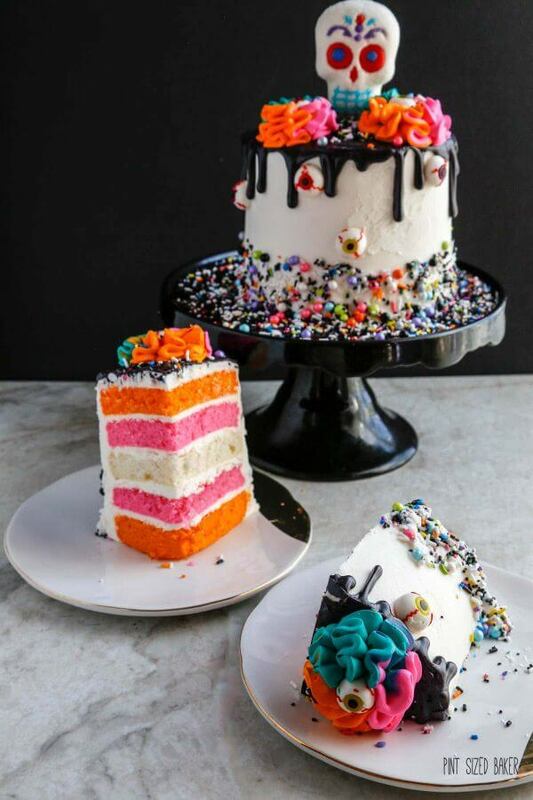 The contrast with the white frosting, the black drip, and neon sprinkles… I’m obsessed.